We are an Australian registered charity with a passion for providing education and support to children in Australia and Overseas. Inspire foundation is committed to educating our children here in Australia. We are on a mission to inspire our youth by facilitating programs designed for children entering school years 6 and 7 which is when they become leaders in primary school and are beginning their secondary education as we know this is a key stage of development. Depression, Anxiety and stress related disorders are not just affecting our adult population, in fact the latest statistics* show around 1 in 35 young Australians aged 4-17 experience a depressive disorder and 1 in 14 of the same age group experience an anxiety disorder. In bold and new paragraph: Suicide is the biggest killer of young Australians and accounts for the deaths of more young people than car accidents! With suicide rates for young Australians the highest in 10 years*, despite a range of prevention strategies and investment from government, female suicide rates have doubled over the past 10 years. It also found youth suicides were twice as likely to happen in clusters than adult suicides. We have carefully designed programs to build confidence, encourage team work, improve concentration, develop emotional intelligence, build resilience, and encourage coping skills. Our aim is to increase happiness and reduce stress, depression and anxiety rates to reduce the increasing suicide rates of Australian youth. Inspire foundation is a committed to providing education for children in developing countries and serving communities in need. Education is a basic human right and with over 70 million currently not in school, changing that fact is key to ending the cycle of poverty. 72 million primary school aged children around the world aren’t currently in school. Childhood should be a happy time spent playing with friends, enjoying a favourite toy – even planning for the first day of school however, these children often can’t go to school because they need to work just to help their families survive. Of those who do go to school, many drop out before they master basic reading, writing and math skills. In half of developing countries, about a fifth of pupils don’t reach the last grade of primary school. Many families in developing countries cannot afford to pay for food let alone school fees or for learning materials, school uniforms, and transport to school. Child malnutrition is a global epidemic that affects one in three children under the age of 5 and undermines their ability to learn. The education crisis affects us all worldwide: it affects the global economy, it impacts on our own happiness and wellbeing (whether we like it or not) and will affect our own children and their children, unless we are willing to contribute. Poverty alleviation is expected to make better progress in the next 50 years than it has in the past 50. As we understand more than ever the importance of education, it is a hand up rather than a hand out! We need your help to break the cycle of poverty and change the future for these children and their communities. In later years their children will also benefit from your help because they then have the ability to provide for themselves. Help us make an impact. Help us share the joy of sustainable giving and make giving a habit so that we can teach our youth to look out for each other, and support one another. Help our youth who are faced with the harsh reality of the modern world and the extreme poverty for our communities who are less fortunate. There are a number of ways that you can help us in supporting our greater community. You can sponsor a child in Australia to attend our eQ youth 1 day workshop for $97. We offer full scholarships to our 1 day workshop for children and families who are not in a financial position to attend the event. As we want to ensure everyone has access to education and support, many of our sponsors contribute by paying for scholarship positions. You can also create meaningful change by supporting our Giving Program for $37 per month. This allows us to continue our mission to give over 1 million givings both in Australia and overseas to help children in developing countries access education, shelter, clean drinking water and food. All donations are tax deductible. Our amazing team of volunteers love helping our youth and their families, and we would love you to join our team! Please email: hello@inspirefoundation.org.au and include current Working With Children documentation. Peter's passion has always been to help and serve the greater community, both in Australia and overseas. Since starting eQ events back in 2001, Peter has donated over $600,000 to the Make A Wish Foundation and he created Inspire Foundation so that we would be able to continue to help children all over the world have access to education, clean water, shelter and food so that they can go on to help others in their community and continue the work for years to come. Mandy has always been passionate about giving back to the community and helping those who are not able to easily access education and basic human needs, like clean water, food and shelter. Since a young age, Mandy has always looked for charities to support and has been involved with many non for profits over the years. 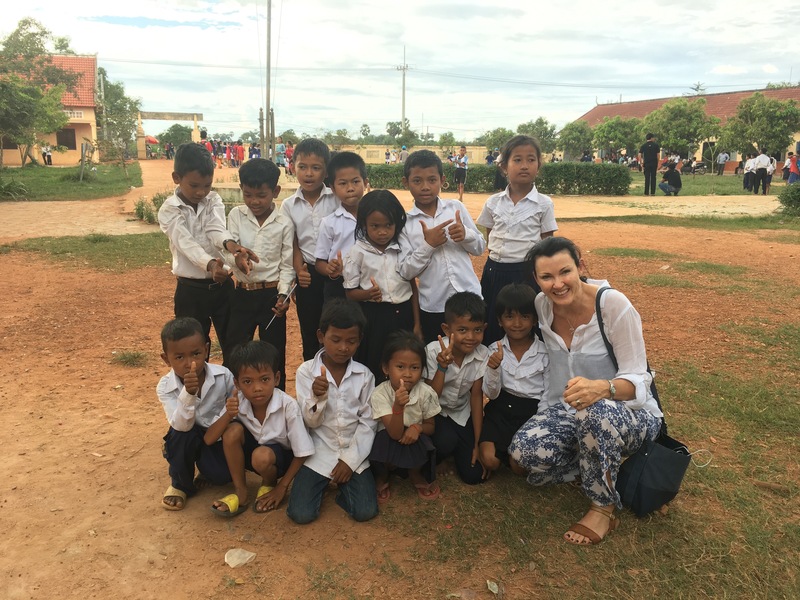 She was incredibly humbled when visiting communities in Indonesia, India and Cambodia, and is driven to creating positive change in communities both in Australia and abroad.